Don’t even attempt to read this on an empty stomach, because it’s virtually impossible to describe Pacific City’s renowned Grateful Bread Bakery without making you hungry. It may not be quite as famous as Cape Kiwanda, but Grateful Bread Bakery has earned a loyal following of visitors and locals. The business first opened about 20 years ago. 10 years later, Robyn and Jay Barcroft purchased the company from its original owners. At the time, Robyn was managing a restaurant in Sunriver, although she had worked as a cook at Grateful Bread Bakery for four years. 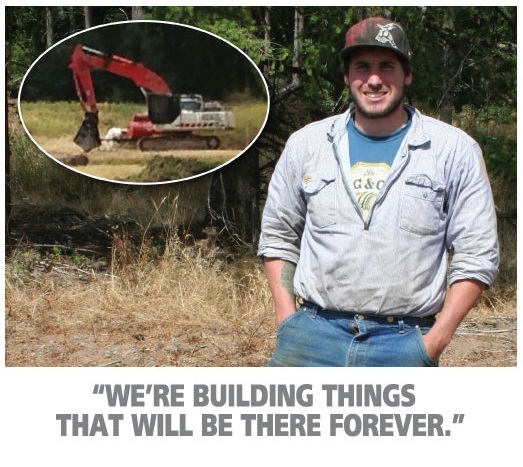 Jay is a local timber cutting contractor. In the 10 years Robyn and Jay have owned the business, they’ve remodeled or expanded on an almost yearly basis. Today, about 30 percent of their revenue comes from direct sales of bakery items at the counter, through their drive-thru or to other restaurants. Breakfast and lunch business, as well as catering, accounts for the rest of their sales. The company employs eight, yet Robyn still routinely works 12-14 hour days. It may come as a surprise, but the name Grateful Bread was originally just a play on words. Of course fans of the legendary band The Grateful Dead began flocking to the bakery, often leaving memorabilia. To commemorate the band and its devoted fans, Grateful Bread Bakery’s entire staff began wearing tie-dyed uniforms. Many of Grateful Bread Bakery’s most popular items are the original recipes from 20 years ago, yet Robyn and her staff continue to add new items on a regular basis. Customer favorites include Grateful Grain Bread, Chocolate Chunk Cookies, Gingerbread Pancakes, Stuffed Focaccia, Vegetarian Lasagna and Corn & Cheese Chowder. The company’s 10 varieties of cookies have become so popular that they will soon be mass distributed under a Grateful Bread Bakery label. Currently under development are gluten-free bread and spelt (wheat-free) bread. Grateful Bread Bakery believes in community involvement. The business often holds cookie promotions, with 100 percent of the proceeds going to local causes. Recipients have included Beaver Food Pantry, Pacific City Community Gardens and Nestucca High School. Unsold bread and pastries are donated to the Kiwanda Community Center daily. Robyn and Jay had been longtime customers of Rose Wharton when she had managed the Cloverdale branch of another bank. When Rose became the manager of Oregon Coast Bank in Pacific City, Robyn and Jay decided to move all their accounts. “We love dealing with Rose and her staff,” explains Robyn. “They’re just so friendly and we can call them any time, knowing that our questions will be answered.” Oregon Coast Bank has provided financing for Grateful Bread Bakery’s remodeling and expansion projects, as well as a line of credit, business checking and a money market. Robyn and Jay also use Oregon Coast Bank for their family accounts. As you can probably tell, all of us at Oregon Coast Bank have become big fans of Grateful Bread Bakery. We’re also proud to be their bankers.